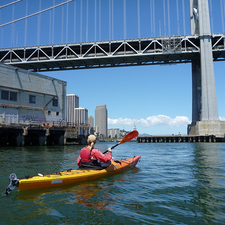 The team of CityKayak provided everything I needed to go Kayaking. I had never been kayaking before and with 10min of basics training I was able to do this tour. You can bring your phone or camera with you to take pictures. They'll provide a dry bag which will keep it protected. Make sure to bring sunscreen and water with you and be well rested. It's a great morning workout. The tour guide, Paul was amazing and the views you get are incredible. If you go to SF this is a must do.